It's been a while since I last blogged. Life gets busy and Instagram takes over. I have been both sewing and doing house projects since I last posted over here. One of my best customers kept me busy with a beautiful swoon quilt and then a bunch of baby quilts (check out my Instagram feed for quick pics of those projects). While my husband was away on a business trip, I got all crazy and decided to redo the kids bathroom. Since my husband hates all my project messes I knew I had to get it done before he got back. The kids and I worked pretty hard and got most of the big stuff done - removed all the old 1980's hunter green fishy wallpaper, tore out the old shower doors, painted the walls, painted the tile grout, and took down the old light fixture. We even installed new shutters on the window and made a curtain all in 3 days. He was very surprised when he got back. After helping us put in the last finishing touches - new light fixture and faucet we called it a success. Then my husband asked if I would paint his little exercise room in our basement. It is in a very dark corner and has 1970's paneling and was in desperate need of some brightening. Of course I could paint that room, but while I was doing that room it only made sense to do the entire basement. I mean why would we stop at just that little room?!?!?! The whole basement needed refreshing. So he agreed to let me paint all the rooms. Well, once I painted the stairway and front room and it looked all fresh and new we (really meaning just me) couldn't live with the crappy old carpet on the stairs so I ordered new carpet and had that installed. Then the old gold brass door hardware on all 9 doors down there didn't really go with our new look so we needed new door knobs. And really then how could we not get matching switch plates. A week after that, I got the middle room all painted but I "accidentally" spilled a can of paint on the carpet in there so unfortunately we need to replace that carpet too. Of course, that carpet is this horrible commercial stuff that is glued directly onto the cement floor so I have to have a professional in to take care of that mess. Then the kids and I will be laying a new vinyl plank floor in the back 3 rooms. And we still have to paint the basement bathroom (which really means new paint, new counters, new toilet and new faucet) and paint the guest room down there. Meanwhile his poor exercise room - the thing that started this whole avalanche of basement freshening up - is still waiting for its final coat of paint. And that my friends is the long story version of why I haven't had time to blog lately. But I did finish this quilt recently and wanted to share it with y'all. 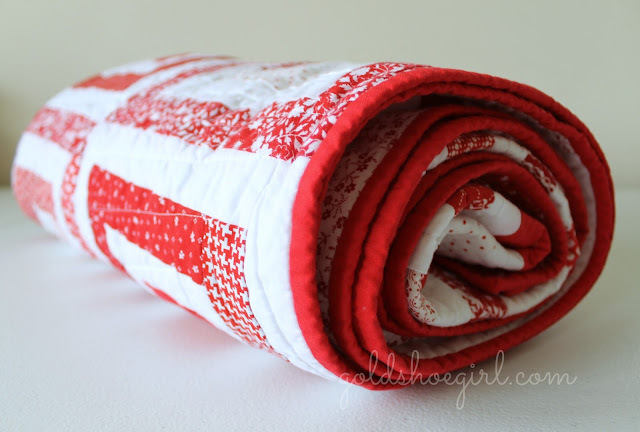 I had been wanting to make a red and white quilt for some time so I ordered a ton of prints not really knowing what I was going to do with them once they arrived. 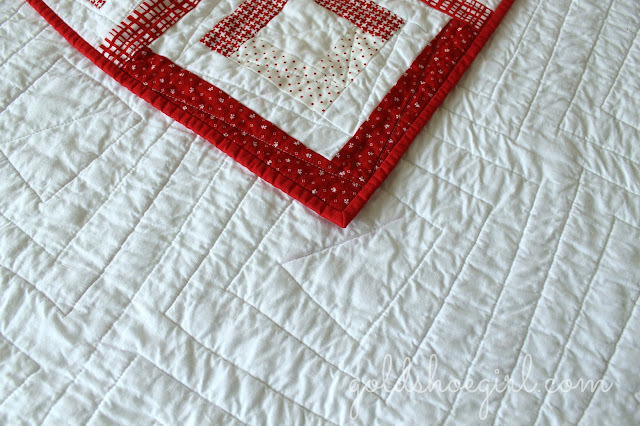 Then I was browsing through pinterest and saw a log cabin quilt and thought it would be perfect starting point for my reds and whites. So this is my version of a log cabin done in red and white prints. I used 15 different prints - florals, plaids, dots, chevrons, herringbone, etc. The center of each block is either solid white or solid red and then I alternated white strips with the prints. I really like having white next to my prints so that you can see the prints better. 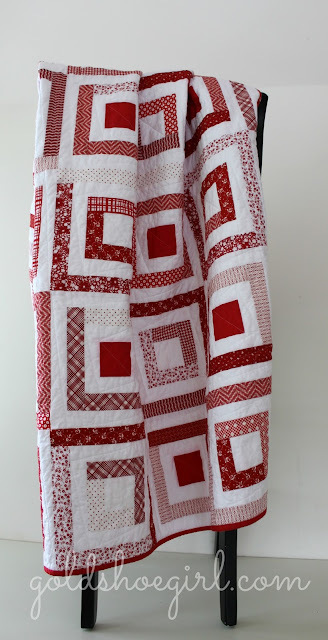 I quilted it using an idea I also found on pinterest which is doing a diagonal line from corner to corner on each log and winding around the block that way. It was a little time consuming but I love the way the back turned out. The binding is the same red solid as the center squares. It gives a nice contrast to the solid white back. I made this up in a lap/throw size with the intention of selling it in my etsy shop. I have listed it here but I love it so much that if it doesn't sell I won't be sorry. 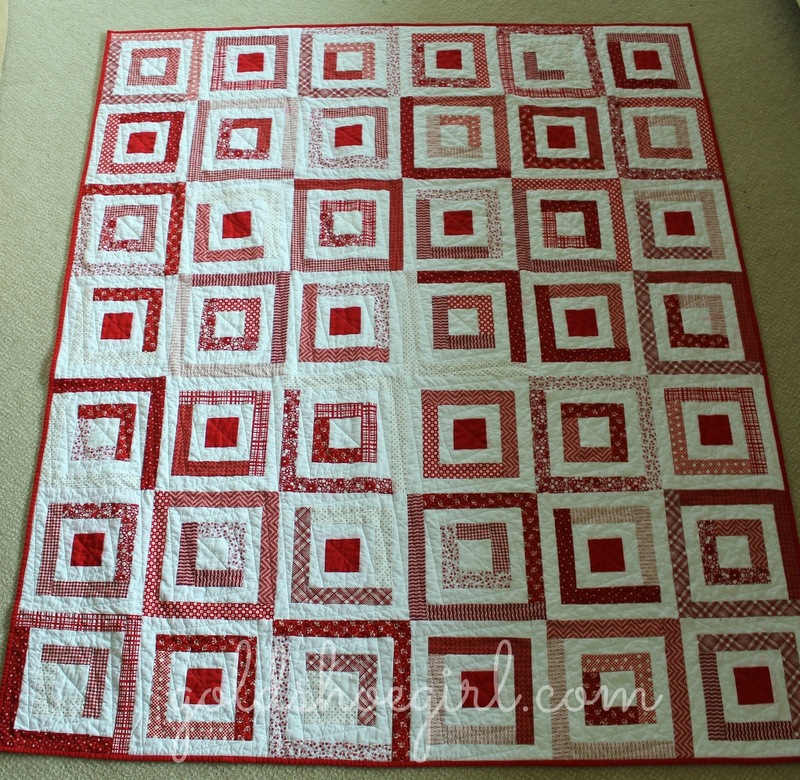 I do have a good bit of the red prints left so I will be making another red and white quilt soon. I'm thinking Irish Chain but would love your input. It has to be simple and fast. I get too bored with complicated patterns. I'm in the middle of a Cottonway Snippets quilt and that is just about as time consuming as I like to get. Funny story! 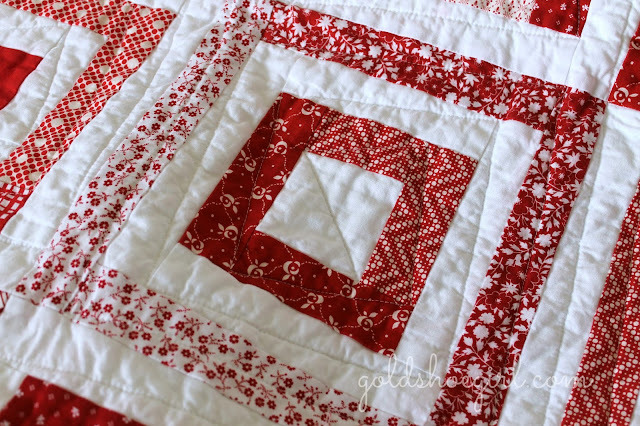 I do love red and white quilts. Yours is so fresh and clean looking. Congratulations. Very beautifully done, always such a classic colour combo! Forgot to say...I need you and your 'team' to come and do some reno on my house!! Or at least send me some of your energy! My "team" works on the bribe payment system...video games, books, junk food, etc:). It's nice that they are just the right age - old enough to actually be helpful but not too old that they are always off with friends yet. Makes our projects go a little bit faster than if I was doing everything on my own. Beautiful! Love the simple color scheme. Thanks Kat! I can't wait to make another red and white one. I love to hear from you. Please leave your thoughts, ideas, questions and comments. If you enjoyed this post be sure to sign up for my feed or get posts by email. Hi, I'm Alissa. Born in NY, career woman turned SAHM now living in a small town in the Midwest with my husband and our 3 children. 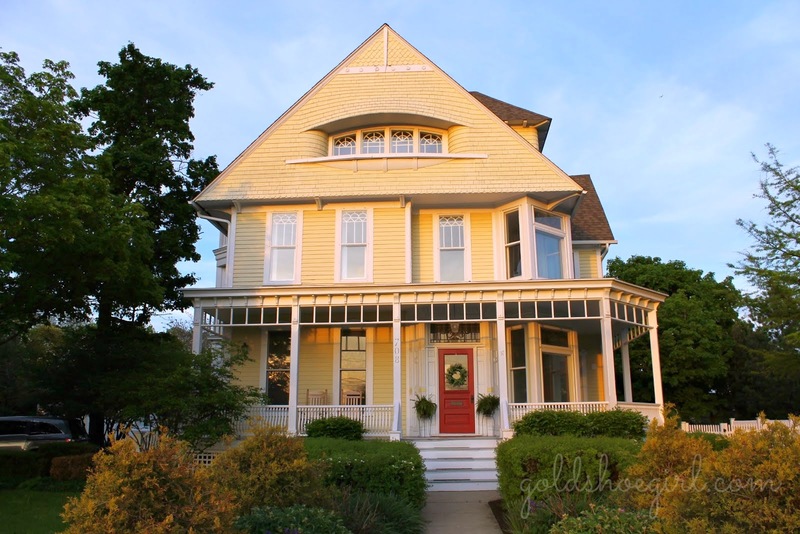 Please join me as I chronicle our diy adventures in our 1860 Queen Anne home, my new found love for quilting, other various crafty projects, my addiction to diet pepsi, and the chaos that goes on in our daily lives. Follow by Email. It's so easy. My posts right to your inbox. Gold Shoe Girl 2011-2012. Simple theme. Powered by Blogger.